Today’s tombstone is brought to you from Mount Washington Cemetery in Independence, MO and belongs to my maternal grandmother, Edith Marie (Brown) Conwell. Edith was the youngest child of Richard Selman Brown and Martha Lucinda (Vaughn) Brown. She had five older sisters and four older brothers. Edith was born 1 December 1912 in Campbell, Dunklin, Missouri and died 7 June 1997 in Kansas City, Wyandotte, Kansas. She is buried next to her husband and my grandfather, Edward B. Conwell, Jr. in Mount Washington Cemetery in Independence, Jackson, Missouri. Thanks for stopping by Tombstone Tuesday! Follow Friday: Are My Roots Showing? 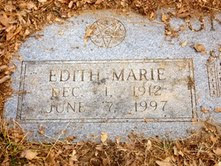 I am interested in knowing what the symbol is on Edith Marie's marker. That symbol is the emblem of the Order of the Eastern Star, one of the several organizations that are part of the Masonic fraternity. My grandmother was a long-time member of the organization. The other emblem you can only partially see on the tombstone to the right of her name is a rendering of an LDS temple.